CLEARWATER, Fla. - Sept. 29, 2016 - PRLog -- This year, Boy Scout Troop 313, chartered by the Church of Scientology Flag Service Organization, celebrated its 20th Anniversary with many major accomplishments along the way, including Scout Leaders receiving the prestigious Silver Beaver Award. First established in July 1996, the troop has progressed from meetings in a very small room with 8 leaders and 8 scouts to 38 scouts weekly active in a large room at Clearwater's Delphi Academy. Over the last 20 years, they have made a total of 31 Eagle Scouts; a rate of more than one a year. "The Boy Scout program has had a major impact on my life. Doing many hours of community service made me realize that I really like helping others and giving back to the community. Now I work full-time at a school, helping youth succeed," said Damian, Eagle Scout from Troop 313. Of all the awards Troop 313 earned including, many adult Wood Badge awards and countless "Cleanest Campsite" awards, their most noteworthy are the 3 Scout Leaders who received the prestigious Silver Beaver Award. This award is given to Scout Leaders for their hard work, self-sacrifice, dedication, and many years of service. "L. Ron Hubbard was an Eagle Scout himself, accrediting many of his life skills to the Boy Scout program. He said, 'Of all the various information which became important to me, such as photography, woodlore, signaling and many other subjects, the basis of it was laid in Scouting,'" said Dylan Pires, Community Affairs Director for the Church of Scientology in Clearwater. 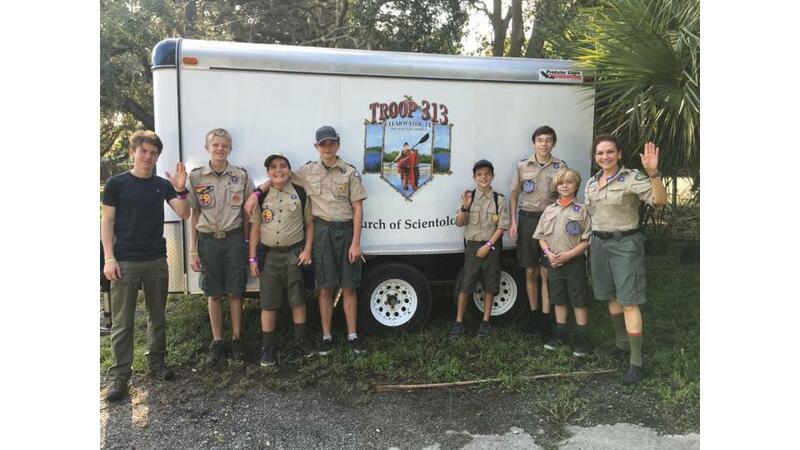 Troop 313 is open to boys of any faith, as with any troop. Boys in the Scouting program are encouraged to be faithful and loyal, as laid out in the Scout Oath and Law.